Software can be resource intensive and require the lion’s share of the system resources and in such cases there’s no easy way to close all the unnecessary background processes and free up system resources.If you play Games which require higher resources you can try Game Booster which optimize and boost system performance for better game play and rendering while playing games.If you are looking for any other system application for needs similar optimization you can try AppBooster for boosting system performance, which can automatically free RAM and CPU by quitting all unneeded background processes and OS services making more system resources available for your favorite games and apps. 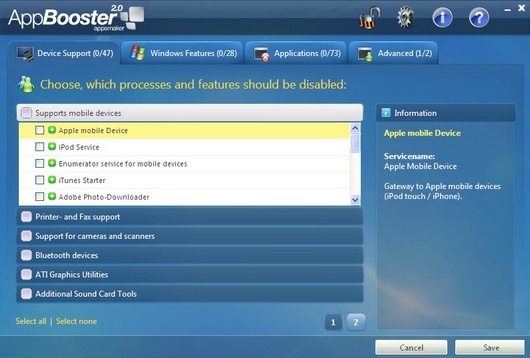 Booster Profiles can be customized with options to disable unnecessary processes when the profile is selected.Processes and services to include and exclude for closing during booster mode for better performance can be maintained for smooth functioning of any applications during the game mode.Services and applications shut down by AppBooster can be restarted without a system restart after closing the Booster Mode.Shortcuts for Booster Profiles can be created for faster optimization and easy access. The system can be reset back to its original state with all the closed process restarted once AppBooster Mode is deactivated without needing to restart the system and the application is compatible with Windows OS.